Destino Ibiza, for a series of open air parties on Thursdays 31st July, 14th and 28th August and 11th September. Starting at 4 in the afternoon and carrying on the dances till midnight, the lineup is featuring some of the hottest names in the game, along with the Cadenza and Aether Artists DJs. The party keeps then rolling on in the small underground venue Tox, the nightclub located below the lobby of Destino. Luciano’s label is giving this unique opportunity to its artists to build their platform by inviting, each one of them, one of the clubs they work with throughout the year and by hosting their own party with the DJs and friends they collaborate with. 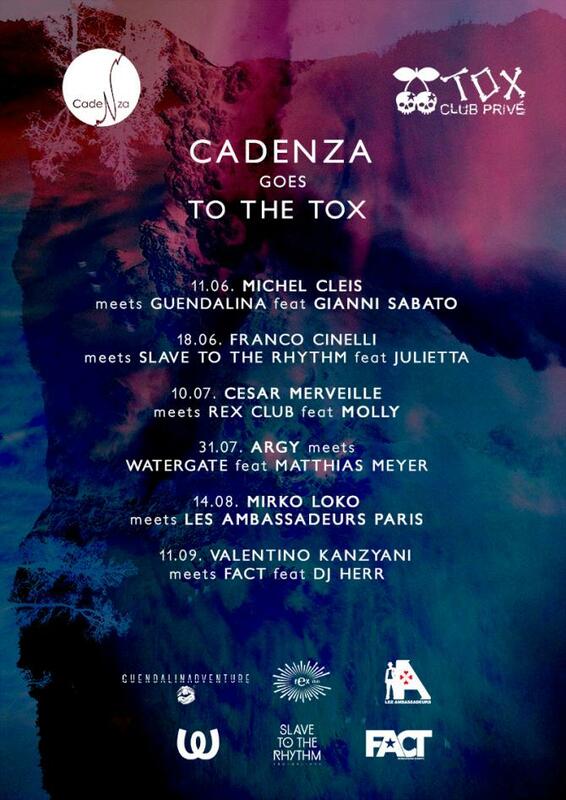 Cadenza Goes To The Tox is another stepping stone in the summer season for Luciano’s label: along with the highly successful Origins party at Amnesia on Mondays and the Luciano & Friends events at Destino, this residency in one of Ibiza’s hottest spots is heating up once more the label’s thriving plans for summer 2014.